Did you know that there's a video game where George Washington is evil? And that it's made by the French? Yesterday, when Ubisoft released the first part in their trilogy of downloadable content for Assassin's Creed III, Fox News wasn't pleased. The French? Evil George Washington? Surely somebody should be offended by this! So they posted an article titled "French company releases video game depicting George Washington as villain to be assassinated." A day after the United States honored George Washington, a French software company released a video game that depicts the first president as a tyrant who hangs people and must be assassinated. Just look at that lede. The subtle xenophobia, the muted anger. Written as if with trembling fingers and bulging eyeballs. HOW DARE THOSE GODDAMNED FROG-EATERS TURN OUR FIRST PRESIDENT EVIL. The game, titled "Assassin's Creed III: The Tyranny of King Washington" and released Tuesday by Ubisoft, can be played on Nintendo Wii, Xbox 360 and PlayStation 3. The game presents an alternate reality that depicts Washington as "the former champion of American freedom turned power-mad overlord," according to its creators. "With the introduction of our first single-player episodic DLC 'The Tyranny of King Washington,' we figured we should reacquaint you with the hero you thought you knew," Ubisoft says in a statement on its website, underneath a promotional video showing an evil-looking Washington wearing a crown and gripping a throne with the American flag draped overhead. And the comments! Half of them call the article dumb; the other half are about as xenophobic and generally terrifying as you might expect from comments on Fox News. They're the scoop of hatred atop this glorious outrage sundae. 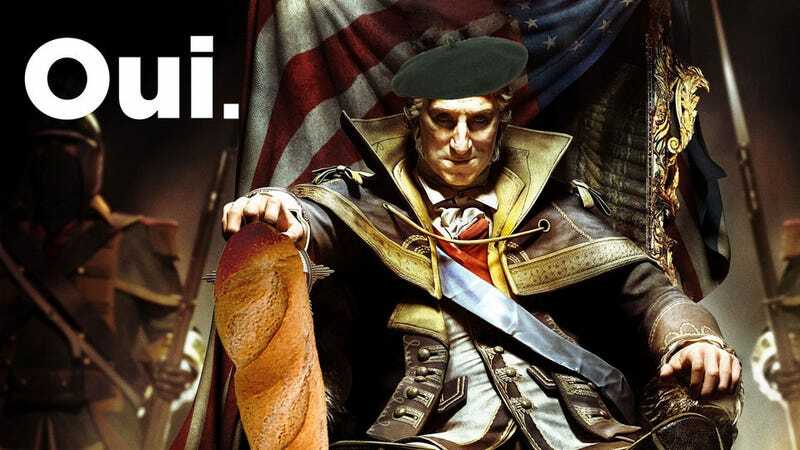 Some American software company should make a similar game with an heroic French leader as it's subject...oh wait...I forgot...there have been NO heroic Frenchmen. Video games and the Frogs: both a waste of time! The only villains that need to be assassinated are socialists. That would pretty much take care of the country of this games origin. Maybe they got him confused with Obama? Maybe they did, brian2799. Maybe they did.